邹倩, 孙育良. 球囊二次扩张椎体后凸成形术治疗老年重度骨质疏松性椎体压缩骨折[J]. 中国医科大学学报, 2018, 47(1): 27-31, 35. ZOU Qian, SUN Yuliang. 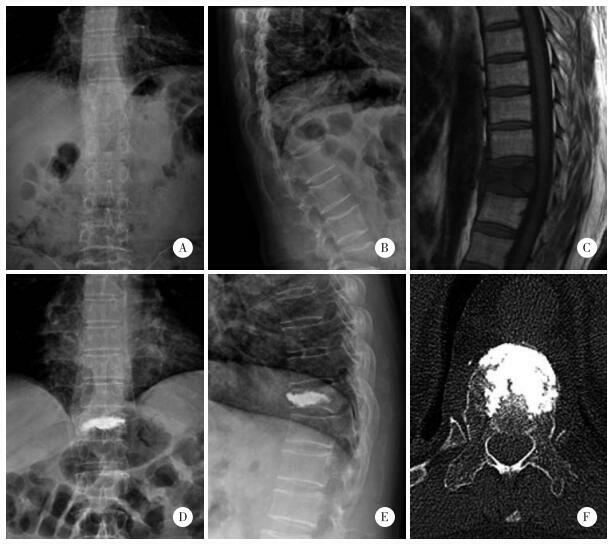 Application of Double-balloon Dilation in Percutaneous Kyphoplasty in Severe Osteoporotic Vertebral Compression Fracture in the Elderly[J]. Journal of China Medical University, 2018, 47(1): 27-31, 35. Abstract: Objective To evaluate the efficacy of double-balloon dilation in percutaneous kyphoplasty for severe osteoporotic vertebral compression fracture (OVCF) in the elderly.Methods Sixty patients with severe OVCF were randomly divided into two groups, a double-and a single-balloon dilatation group, with 30 cases in each group. Regular follow-up was conducted at 3, 6, and 12 months after operation. The operation time, blood loss volume, bone cement injection rate, and bone cement leakage rate were recorded. The visual analog score (VAS), Oswestry disability index (ODI), vertebral anterior height, and kyphosis Cobb angle were used to evaluate efficacy.Results No significant differences in operation time and bleeding volume were found between the 2 groups (P > 0.05). The amount of bone cement injection in the double-balloon dilatation group was more than that in the single-balloon dilatation group (P < 0.05). The bone cement leakage rate was lower than that in the single-balloon dilatation group, but the difference was not statistically significant (P > 0.05). No significant differences in VAS score and ODI were found between the 2 groups at 1 day and 3, 6, and 12 months after operation (P > 0.05), but with statistical significance of the anterior vertebral height and kyphosis Cobb angle difference (P < 0.05). During the follow-up, 2 cases of complication occurred in the double-balloon dilatation group, but 6 cases of complication occurred in the single-balloon dilatation group.Conclusion Double-balloon dilation in percutaneous kyphoplasty for elderly patients with severe OVCF can effectively alleviate clinical symptoms and reduce complications, which is an effective method for the treatment of severe OVCF. 1) compared with double-balloon dilatation group，P < 0.05. 刘洋, 李明辉, 梅红军, 等. 皮椎体后凸成形术后骨水泥渗漏的回顾性分析及预防策略[J]. 中国骨质疏松杂志, 2013, 56(4): 251-253.